For the S&P 500 (Index: SPX), perhaps the biggest market-moving news of the fourth week of January 2019 came on Friday, 25 January 2019 with the announcement that the latest partial U.S. government shutdown would come to an end. Investors reacted to the news of the end of the 21st federal government shutdown since the 1974 Congressional Budget and Impoundment Control Act first set up the modern budget rules the U.S. government follows by bidding up stock prices, with the index rising 0.85% on the day. In other words, the federal government shutdown was very nearly a complete non-event where investors were concerned. The standard deviation of the daily change in the S&P 500 and its predecessor indices since 3 January 1950 is 0.96%, where the change in stock prices in response to the news the U.S. government would fully reopen is nearly indistinguishable from the market's daily random noise. It was however enough to move the level of the S&P 500 closer to the top of the redzone forecast range on our spaghetti forecast chart, which if the index rises above that level, would be a signal that something more interesting is happening in the U.S. stock market. But will it? That will depend upon the random onset of new information that investors learn next week, with the biggest event likely to come on Wednesday, 30 January 2019 when the Fed concludes its next Open Market Committee meeting, when they might provide guidance to investors on what to expect from them with respect to U.S. monetary policies in the upcoming future. 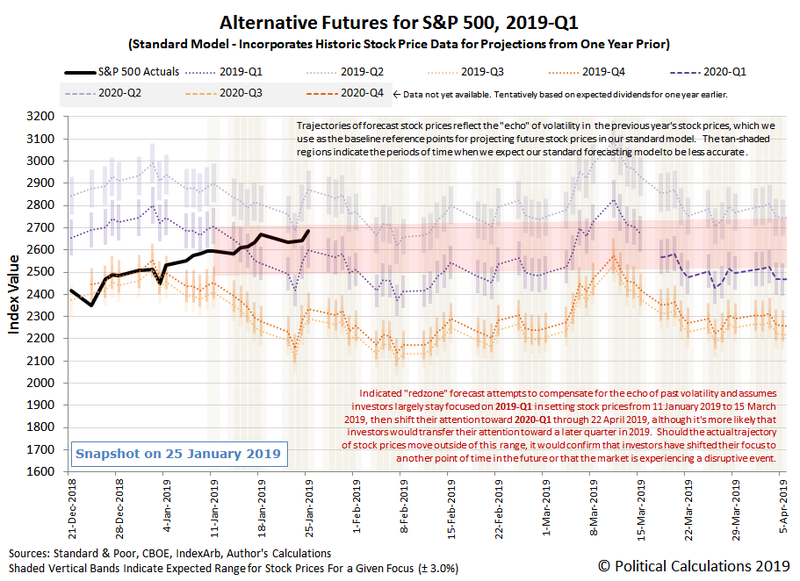 As for what happened last week, there really wasn't much news to influence U.S. stock prices in the holiday-shortened fourth week of January 2019.